Designed for recreational runners with a 5-10 miles per week base, or the ability to sustain an 10-12 minute mile for a 5k distance. This camp is perfect for runners who desire a plan for peaking for the Mad Anthony 10K on May 18, or experienced runners who are looking to improve their current 10K time for any spring race. This camp includes a training plan, two group runs, and cross training for injury prevention. The group runs will be held Tuesday evening at 5:30pm, at the Waynesboro High School track for speed work, and Saturday mornings at 7am, at the Waynesboro Area YMCA for distance work. Each participant will be given a training plan to include independent runs, and the option to register for one Bodypump class per week (included in the camp fee) as cross training. 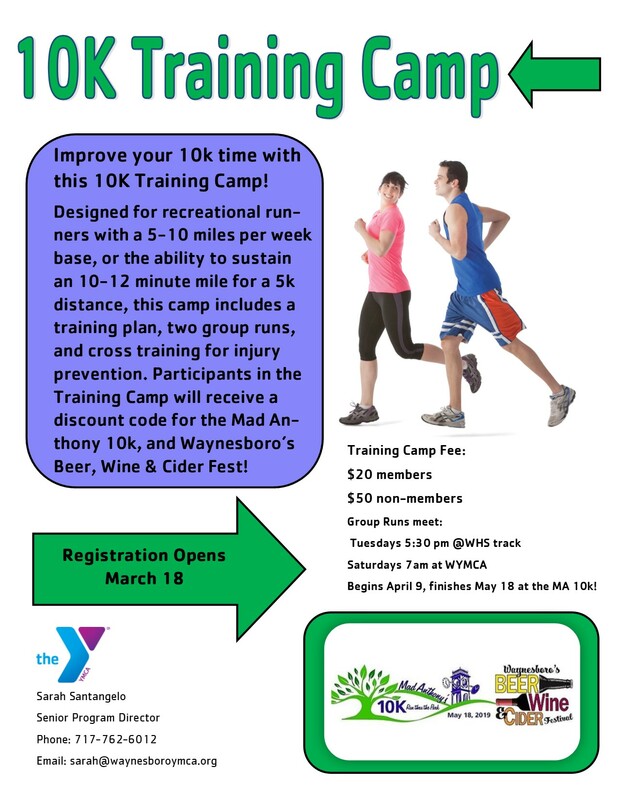 Participants in the Training Camp will receive a discount code for the Mad Anthony 10k, and Waynesboro’s Beer, Wine & Cider Fest! Begins April 9, finishes May 18 at the MA 10k!